These four boys grew up in the grey and rainy Brussels area, in the shadows of cherry blossom girls. Their adolescent times consisted in riding their BMX like bandits to scare the neighbourhood and playing their cointreau fuelled rock music on Sundays. They could have been drifting about like that for years but one fine evening of 2004 they seized the chance to open for the sonic popsters of Alfie at the famous Brussels club Botanique. The first page of Minerale's story was written. By that time, their path became one of fair promisses, after some seminal concerts accross Belgium, to name but the most stunning : first the "Concours Circuit" (they were second best band & won the "audience selection" prize), and then, twice, the "Dour Festival". In between, Minerale also opened for Archive in 2005 at the "Nuits Botanique" festival. The band signed to 62TV records (Distribution Bang!) and then met the famous new wave doctor Peter Crosbie, rounding up in the best way possible the first cycle of their melodic journey. 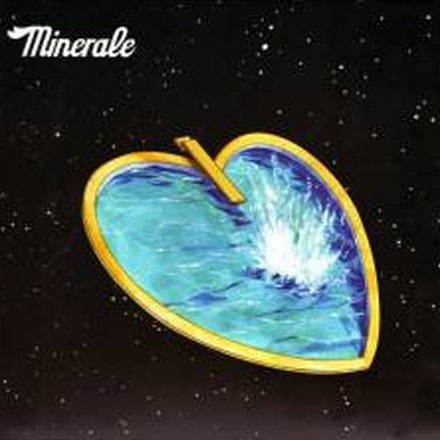 Soon after that, fully willing to give the best of themselves, Minerale delivered their first single " Eyes, eyes " on the Belgian radios, which appeared to be perfectly refreshing for the summer heatwaves of July 2006. The album then follows shortly on October 5th, building on more atmospheric and catchy tunes sprinkeled with sparkling lyrics about the myths of absence, over a bitter-sweet spleen background… A deep dive into a swimming pool of mineral water under the moonlight of a cosmic night. An album like a space station, full of rooms waiting to be visited: from the cockpit, lovingly decorated by Pink Floyd and Pavement, to the effective and reliable engine room of Mercury Rev, then through the corridor of the 1000 encounters alongside Sparklehorse. To summarize: a trip from your most intimate thoughts to pure pleasure and back.